Three awesome things have happened in the last 24 hours, and I wanted to share my excitement with all of you - my readers. And what better way to do that than have a small giveaway, right? First, let me tell you about the things that happened. We reached 150 (well technically 151) followers! We have gotten 50,000 views on this blog. KI released the Slow-Poke Sloth mount for April Fool's Day! Follow this blog and comment on this post by 12:00pm eastern on Friday, April 5 and tell me your favorite thing about my blog. That's all you have to do. 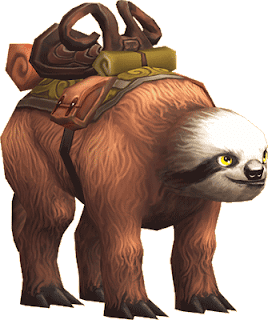 On Friday I will randomly choose 2 winners from the comments and gift each one a Slow-Poke Sloth mount on Wizard101. *Note* If you are commenting anonymously, please also include your W101 name in your comment. you have a lot of useful info on this blog. and i love the graphics they are awesome. I like your background. It combines Wizard and Pirate in a Twilight Zone style. Woah the name is really eye catchy now! Great work Autumn! What i like the most thou it was like that even before is how well organized and easy to navigate around the blog is! For me thats very important cause i wont lose interest in site :D I like to cruse slowly around blog and to see every detail, and this design now truly let you do exactly that! My name is Destiny SeaSong, and I like the timely, and useful info you have. You keep a very updated blog, which is more than I can say about a lot of blogs. I also like how you keep it open, not a member only comment. It makes your blog much more appealing, and makes me want to come back again. Thank you! Good luck everyone else, and that's a generous raffle! I like the website layout. It is very neat and nice and its easy to find what you are looking for which also makes it user friendly. I like the design of the site, it looks modern and trendy. I also like the name of the Blog name "secrets of spiral" Makes users think that.. Woah this blog tells secrets about the spiral.. so it be should be pretty cool. Can't figure out how to follow your blog. Destiny in game, @kcd3312 on Twitter. First time I looked at your blog, the very first thing came through my mind was the Mooshu theme, I fancy Mooshu and everything in relation. Thanks for the contest.